Behold! the Butcher, the Baker, and the Candlestick Maker prepare to descend into the madness of strange, glowing holes in the ground. Likely they will die in weird solitude, but perhaps they shall return as broken wretches, toting sacks of tarnished treasures. 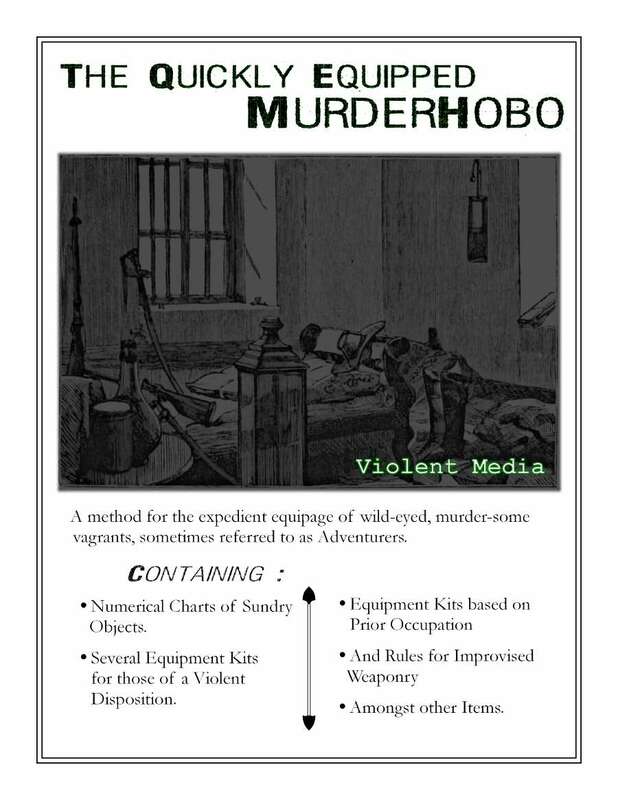 “The Quickly Equipped Murderhobo” is a simple method for determining the starting equipment of new characters. It is written with Lamentations of the Flame Princess* in mind, but will serve amiably for any Fantasy Roleplaying Game. The first booklet outlines simple procedures for equipping new characters, methods for the rapid "equiping" of mid-game replacement characters, as well as improvised weapons rules and a handful of new items. The second PDF contains printable Equipment Kit Chits to give your players in avoidance of tedious notation. Plus, this is a Form Fillable PDF so you make your own more interesting Equipment Kits. Go crush some skulls with candlesticks and rolling pins. *Lamentations of the Flame Princess is the (c) of James Raggi. Neither he nor his publishing imprint are involved in any way with this product.